It was very nice to see how much everyone was able to use English today. All of the teachers were really impressed with all of the children’s ability to communicate. Congratulations to everyone who came today! I thought everyone did an amazing job today for the contest! They gave such a good effort, and really tried to communicate with us English teachers. I can’t wait to see how much everyone improves when next year’s contest comes around! Great job! The children did a really fantastic job speaking English at the contest today. They tried very hard to tell us about lots of interesting things, especially their favourite toys! The parents should be very proud of their excellent communication skills. Well done for a successful day! 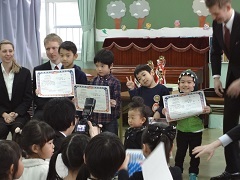 It was a pleasure to witness some many children speaking English so fluently. I thought all the children describing their items in such detail was amazing. Everyone did amazingly and should be proud of themselves and the achievements. I was very impressed with the enthusiasm and English ability of all the children that participated today. You should all be very proud of yourselves and I hope that you will keep using English more and more in the future. It was great talking with the children who participated in the English Speaking Contest today. Everyone did such a good job talking with the teachers. I saw lots of happy faces. 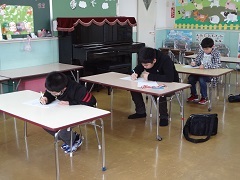 I was really impressed with each child’s English-speaking ability. Great job everyone! I look forward to the contest next year! I was really impressed with how well all the students did today. They were able to speak quickly and correctly about a lot of different topics. Of course, all of the moms and dads should be so proud of all their hard work. I’m excited to see what they’ll be able to do next year! The standard of this years Speaking Contest was fantastic! It was great speaking with all of the children and everyone showed such enthusiasm, excitement and excellent English speaking ability. Thank you to all of the children and parents for attending todays contest and I cannot wait until next years English Speaking Contest. Well done everyone.